In this photo Carl holds a 4-string curly maple fretless bass. 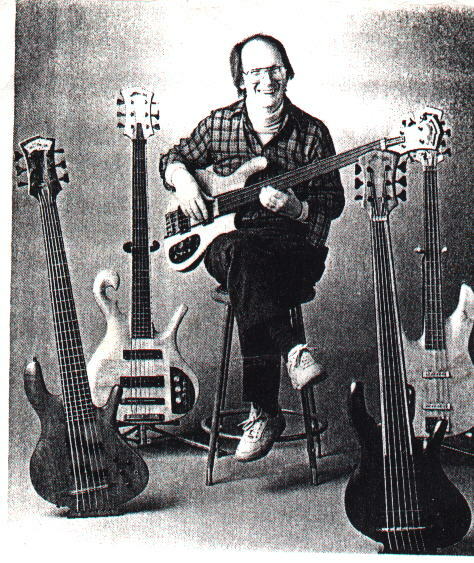 In the foreground, he is flanked by two of his 6-string basses. Note their starkly original body-bridge extensions. In the rear, an early maple scroll-body 6-string and a maple left-handed 8-string. The bass Carl is holding is the one he uses for his gigs. Every Carl Thompson instrument is unique; there are no models, per se. Carl builds about five or six of these uncompromisingly personal, custom-order instruments each year, most of them 6-string basses. Carl moved from Pitcairn, Pennsylvania to New York City in 1967. To supplement his income as a musician, he worked in Dan Armstrong’s guitar shop, where he learned repairs from Eddie Diehl. After Armstrong closed his doors, Carl teamed with Charles LoBue to form the Guitar lab. The pair split up, and in 1971 Carl set up a new shop with fellow guitarist Joel Frutkin. The first Carl Thompson bass was made in 1974. Soon, noted players such as Anthony Jackson and Rick Laird placed orders. Carl gained considerable notice after designing and building a bass for Stanley Clarke. Shortly after that Carl and Craig Bennett built a 36-inch scale, twin truss rod mahogany 6-string bass for Anthony Jackson. The carved heel block is a distinctive feature of every Carl Thompson instrument.